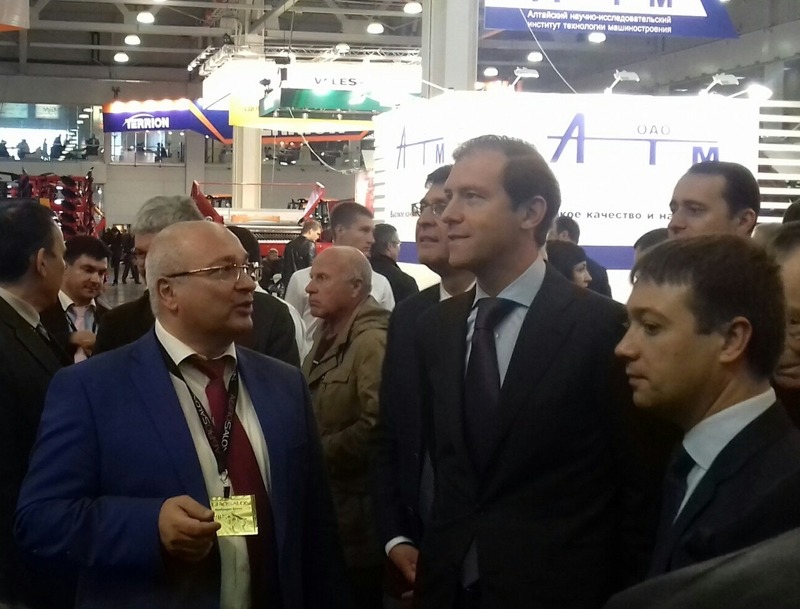 Within the framework of the visit to the trade fair AGRITECHNIKA-2017, First Deputy Minister of Agriculture of the Russian Federation visited the stand of Liliani Company. The Rostov manufacturer presented its solutions for the logistics of grain and oil crops harvesting, seeding, storage, and transloading. At the fair Liliani demonstrated the updated line of its machinery: a grain transfer trailer GTT 16.S2 with two sections, the new variety of a grain bagger with a preservative distribution system GB-01C, and, as well, the machines which functionality and originality had intrigued sophisticated European consumers — a grain transfer machine MDP 450 and a multifunctional unloading machine MGU 300. Among other exhibits, Liliani presented a two-section grain transfer trailer of new “compact” series with the capacity of 16 tons. This machine has many technical novelties. Among them, one can point out an electro-hydraulic drive system that significantly increases the convenience of work. Two-section construction is a new design solution for grain transfers. Owing to this system one machine can receive both seeds and fertilizers and then consecutively load them into a seed drill. Grain and fertilizers are loaded into a bin through a self-loading auger system (SLAS). The SLAS is equipped with its own net filtration system that divides solid fractions from the loading material, and a grain treatment system. So that one can deal with cheaper inoculum with short life period. Besides, one technological process – the process of grain treatment is no more of the threshing floor. And, of course, strain-gauge weigher with online data transfer terminal and a system interlocking the unsanctioned unloading – without the authorization of receiving motor vehicles. This feature was more significant for Russian and Kazakh companies. The vast interest of visitors was excited by the Liliani premiere – multifunctional version of an unloading machine created on the base of the traditional unloader of bags. New equipment which unloading rate increased up to 300 tons per hour allows not only to transfer grain while unloading from bags but to load it into baggers (including preservation), transfer it from threshing floors, load seeds and fertilizers into seed drills (with simultaneous treatment), load materials into hopper cars, etc. An updated variety of the grain bagger GB-01 C with a preservative distribution system allowing to load both dry and moisturized grain into bags pleased animal breeders and chicken breeders, and farms that are forced to harvest under high humidity conditions. The grain transfer machine MDP-450 was presented in its new variety as well: its construction was seriously changed, the system of hydraulic side sliding was added – to make the process of ‘siding’ with a motor vehicle more convenient. Dzhambulat Khatuov highly appreciated the technical approaches of Liliani and efficiency indexes reached owing to these approaches. 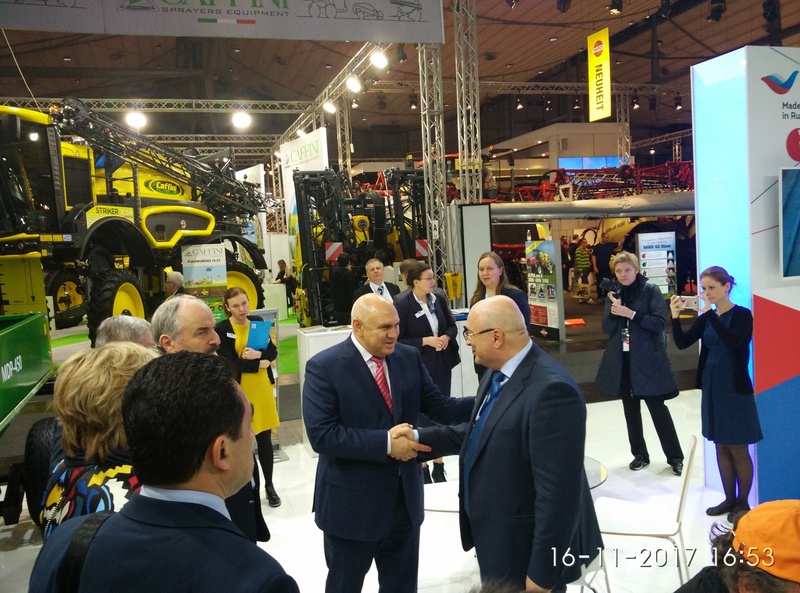 The delegation also included Petr Chekmarev, the Director of the Department for Crop Production, Mechanization, Chemicalization and Plant Protection of the Minselkhoz of Russia, Alla Elizarova, the Director of Russian Association Rosspetsmash and others. AGRITECHNIKA trade fair was traditionally held in Hannover, at the exhibition centre Messe.